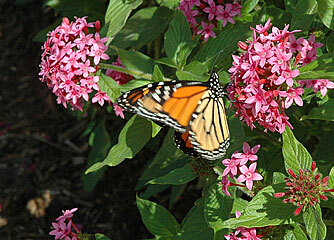 Butterflies, Bugs and Botany at Fair Park. Located at historic Fair Park in Dallas, Texas Discovery Gardens is a year-round urban oasis filled with natural wonders for visitors of all ages. Ten different themed areas include a butterfly habitat, native wildlife pond, scent garden, shade garden and heirloom garden. At family events offered throughout the year, children and parents can share the experience of being amazed and inspired by nature's intricate web of life. Gardening workshops and guided tours provide expert advice on using native and adapted plants to create backyard habitats for butterflies, birds and other native wildlife. At Texas Discovery Gardens, visitors discover a wealth of information on ways to restore, conserve and preserve natural environments in urban areas.